By Don Wix, this is the definitive book about the history of Quorn Village. Over 300 historical images, anecdotes, documents, maps, and records with descriptions and discussion. 'Quorn’ conjures a variety of images – village, town, dormitory for Loughborough, hazard on the A6 to Leicester, flooded crossroads, The Hunt, a disappearing Buddon Hill. Today the place exists in its own right. Long ago at the time of Domesday Survey it was not mentioned and was probably a tiny chapelry with almost no dwellings. Barrow-on-Soar was the Manor and the Mother Church. Reasons for Quorn’s growth and prosperity from early days are based on its position, on the patronage of aristocracy in the heyday of hunting and on the nineteenth century efforts of industrialize the growing village. It is the position in relation to Barrow Bridge which gave it a road to cross the main north to south route up the Soar Valley and thus produce ‘Quorn Cross’. Perhaps this was an extension of the ‘Salt Way’ from the east-coast to the west midlands. The road seems to finish in or near to Barrow and is lost in antiquity in Charnwood Forest. The eighteenth century Turnpike Act improved the main road by ensuring extra maintenance paid by user-tolls and increased the stage-coach traffic from London to Manchester as well as encouraging the growth of coaching inns in Quorn for the exchange of horses and refreshment of passengers. Charnwood Forest had been a hunting ground since Saxon times when Forest Courts were held nearby at Whitwick, Groby and Shepshed. Quorn, between the two great Manors of Barrow and Beaumanor, both of which were the scene for twelfth and thirteenth century hunting parties, was well placed for the later development of enclosed deerparks and the eventual establishment of the Quorn Hunt, fathered by Hugo Meynell. Land in Quorn was in ownership of very few people and favoured pastoral farming because this involved less labour. The grass grew well on the rich alluvial deposits and gravel terraces; flooding which would harm the crop-growing was much more of a help to developing good grassland. The eighteenth century field-enclosures had also aided pastoral farming by making smaller fields. 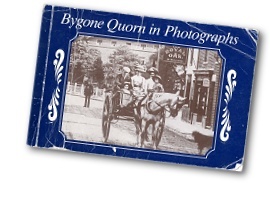 Bygone Quorn in Photographs can be purchased directly from Quorn Village On-line Museum, cost - £7.00 plus £3.00 postage and packing. Please click here to contact our team. Return to quorn village publications.